The low number of Black men receiving Ph.D.s in engineering is sobering. Brian A. Burt, an Assistant Professor of Higher Education at Iowa State University, wanted people to hear from the Black engineering graduate students he has studied. In his talk kicking off Penn GSE’s 11th annual Visiting Faculty Scholars of Color series, Burt asked members of the audience to participate by reading aloud quotes from his study. “There is not that support there for me to succeed,” one of the men told him. “I’m looked at differently. I think I’m scrutinized even a little bit more,” said another. “Well instead of going through this prejudice in my school and my department, I can go and get a job with my master’s degree and make good money and work my way up. The plan changes,” a third told Burt. In 2017, only 1.1 percent of the doctoral degrees in engineering awarded in the U.S. went to Black men. 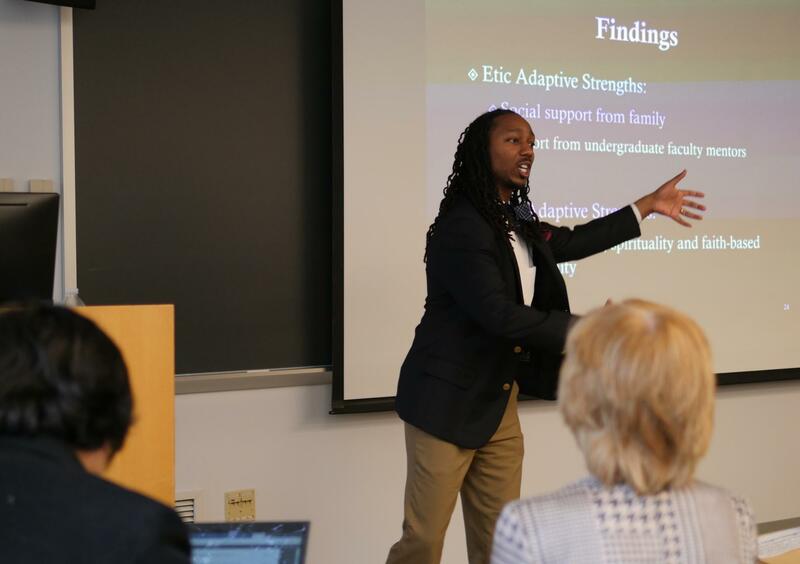 Burt presented results, findings, and recommendations from two studies that have tracked 42 men in Ph.D. programs at four Midwestern tier-one research institutions in the American Association of Universities. While Burt doesn’t reveal the names of the programs, he told listeners to “assume this presentation is your institution,” because the results probably hold true there too. In his research, Burt said Black students routinely told him they were one of the few Americans of color in their courses, felt excluded from study groups, or felt classmates believed they were only in their program because of affirmative action. In most cases, these students had been among the top of their class in high school and undergraduate programs. The lack of Black male students, faculty, and staff at the highest levels of education matters, Burt said. If universities are serious about diversifying STEM fields — and encouraging more young children to become interested in STEM subjects — they need to make significant changes. As part of his visit, sponsored by the Dean’s office and HEARD: The Hub for Equity, Anti-Oppression, Research, and Development, Burt also led a discussion with Penn GSE students about his research and life in academia.